If home automation hasn’t already found its way into your life, there is a good chance that it will in the next year. Amazon’s Echo Dot and Google’s Home Mini were the two biggest sellers of the holiday season, and while they offer features like voice search and automatic reordering of your favorite Amazon products (not to mention they are both pretty great little speakers to listen to music), they both also offer home automation features that are becoming more and more popular. Home automation doesn’t mean that you have to choose between these two battling titans, though. There are a number of products on the market that will help you automate your home simply by using your smartphone. The problem becomes knowing how to get started. It’s the very fact that there are so many options on the market that automating your home can feel like an overwhelming task. If you are interested in home automation but aren’t sure about how to get started, don’t worry! West Coast solar has worked with hundreds of clients in the San Francisco and Sacramento areas to automate their home and help them save money. Thanks to our experience, we can offer some very easy and practical ways to dip your toe into the home automation waters. The home thermostat is a popular choice for getting started with home automation. That’s due in part to the cost-saving benefits it provides. Most people have converted their old thermostats to electronic ones that can be set at different temperatures throughout the day. 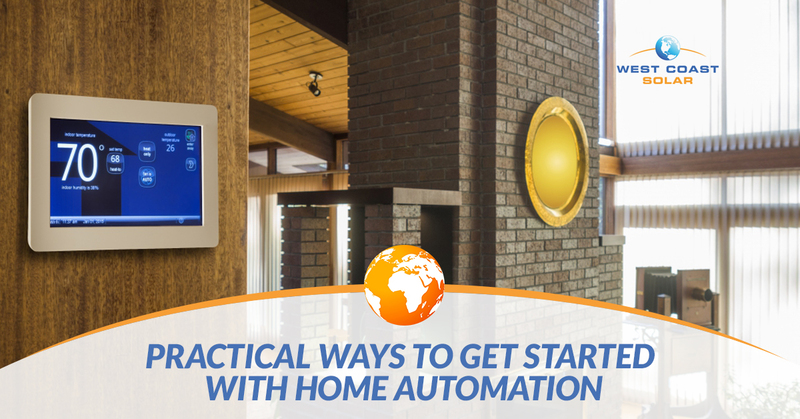 Smart home thermostats can take that kind of automation to the next level. A smart home thermostat can be controlled on your smartphone, so if you are out shopping and notice that’s it’s started to rain, you can bump up the temp at home a few degrees so it’s nice and warm when you return. Smart home thermostats will also “notice” when the house is empty and automatically lower the temperature so you aren’t paying to heat an empty house. You’ll have total control over the temperature of your home, which can help lower your monthly energy bills. Change out a lightbulb or two. You can get really complicated with your smart lighting system and develop incredible scenes for every movie you watch or every activity that you do in your home. But you don’t have to jump into the deep end. Start by purchasing a smart bulb for one or two lamps in your home and experiment with them. While some smart lighting systems will require you to purchase an in-home hub, it’s not a necessary investment if you just want to make one or two lights “smart” in your house. Look for wi-fi enabled color-changing bulbs that can be controlled by your smartphone. You’ll be able to turn the bulbs on and off via the app on your phone, set timers so they go on and off automatically, and set different colors to create a mood in the room. It’s a fun way to explore the possibilities of smart lighting without spending a fortune. If you decide that you like the additional features, you can invest in a lighting hub that will give you even more features and benefits. The doorbell was one home feature that was begging to be upgraded. Switching to a smart doorbell can give you a lot more control and security over what’s happening at your front door. Today’s smart doorbells have features such as cameras that switch on automatically when someone presses the button. The video is relayed to your smartphone (or even your television set) so you can see who is at the door without leaving the comfort of your couch. Many smart doorbell systems also allow you to talk to the person at the door without actually being at the door using a speaker system that’s also connected to your smartphone. The major bonus is this: you don’t have to be at home to see who is at the door or speak to them. These features will work anywhere you are at in the world as long as you are connected to wifi. That means if your neighbors stop by while you are enjoying the beach in Hawaii, you can let them know you are out. Or you can speak to the delivery guy and let him know he can drop off the packages next door. It’s also a great way to make it look like you are home when you aren’t, which can be a deterrent to would-be thieves. Upgrade to smart smoke detectors. Smart smoke detectors are another easy way to join the world of home automation. You might think your smoke detector is doing its job simply by sensing smoke in the air and emitting that loud noise to make you aware of the problem. But when you see the features of a smart smoke alarm, you’ll see why the older version needs to go. Smart smoke detectors connect to an app that’s on your phone. The app allows you to quiet the smoke detector if it goes off when you are cooking. They also routinely test themselves and let you know if there is an issue with an alert on your phone, so you won’t have to remember to do the annual testing yourself. Most models combine several different types of monitoring into one device, too, so you’ll be covered not only for smoke but carbon monoxide and other hazards as well. Maybe one of the best features, though, is the fact that the smoke detector will alert you to an issue on your phone no matter where you are as long as you are connected to the internet. So even if you are on vacation or at work, you will know if the system has detected smoke or dangerous carbon monoxide levels within your home and you can take the appropriate measures. Try a smart lock on your front door. Smart locks give you a lot more control over who goes in your door and how they gain access to your home. Some smart locks need to be installed in place of the traditional lock on your door while others work in conjunction with the hardware that’s already in place. Smart locks can be locked and unlocked remotely using an app on your phone. This allows you to do things like unlock the door for a delivery driver or lock it when you forget to do so after leaving for work. Some smart lock systems can work as a sort of check-in system with your children, too, letting you know when they come home after school or after you’ve gone to bed. Other smart locks allow you to set personalized codes for guests or the delivery man to use to gain access to your home without having a key, meaning you can also delete the code after they’ve gone for increased security. That’s great for those who might temporarily rent out space in their homes for vacationers, too! How Are You Making Your Home Smarter This Year? The key to getting started with creating a smart home is to pick one of these options and try it out. By taking it one step at a time, you’ll be able to avoid getting overwhelmed by features or costs. When you see how automation can benefit your home, you’ll be able to slowly add more devices over time until your home is running flawlessly through a sophisticated smart home system. West Coast Solar can help you get started! We aren’t just solar panels, we also provide home automation installation services to those living in the San Francisco and Sacramento areas. Just get in touch with our team and let’s talk about how you’d like to start automating your home. We’ll help you find the right system, get it installed, and even show you how to use it. Give us a call or fill out the contact form to get a free estimate and to speak to a member of our team about your home automation needs today.